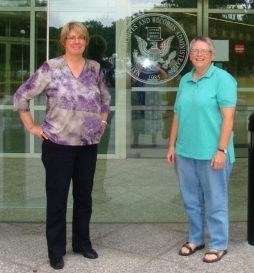 Karen Perdue (left) and Ellen Ganley (right) in front of the National Archives. MorningsideHospital.com was initially the result of research by Ellen Ganley and Karen Perdue into the history of mental health care in Alaska. Once the focus became Morningside Hospital, the volunteer research team expanded in numbers and across the country. They are assisted by Information Insights’ web staff Jana Peirce and Emma Funk, and Nancy Lowe. Ellen Ganley (Fairbanks) – CEO/Principal Consultant, Information Insights Karen Perdue (Fairbanks) – CEO/Executive Director, Alaska State Hospital and Nursing Home Association Marylou Elton (Washington, DC) – Volunteer Researcher, National Archives II Meg Greene (Fairbanks) - Superior Court Judge (retired), 4th Judicial District Vivian Hamilton (Anchorage) – Communications Manager, Alaska Mental Health Trust Authority Sally Mead (Anchorage) – University of Alaska Anchorage Allied Health Programs Robin Renfroe (Fairbanks) - VP Human Resources, Doyon, Limited Deborah Smith (Juneau) – Executive Director (retired), Alaskan Mental Health Board and Denali Kid Care Niejse Steinkruger (Fairbanks) - Superior Court Judge (retired), 4th Judicial District Eric Cordingley (Portland) and David Anderson (Portland) - Friends of Multnomah Park Cemetery Through their research, Eric Cordingley and David Anderson have identified 1,000 people who died at Morningside Hospital.